After many years, BioTek has moved forward with plans to upgrade its application laboratory. 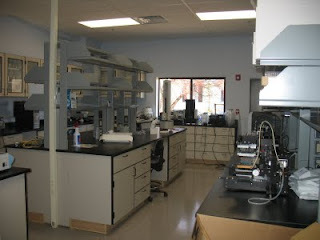 While the original plan was to renovate the existing space, with the need for BioTek to expand its work space it was decided to build a new lab in newly renovated space. Yes, “A Brand New Lab!” While the saga is a bit long I feel that it is representative of many lab renovations as they move from the concept stage to fruition. 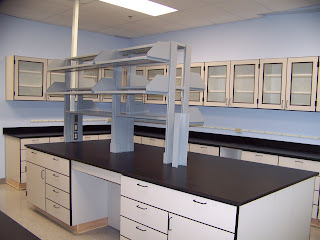 Designing a new lab space is very similar to designing space for home renovation and all in all quite fun. There are a number of guides on how to design a lab, but to get started, you really only need two pieces of information. (1) What function is the lab space intended to serve? In this instance, the application lab is a general purpose lab with tissue culture capability with a staff of approximately 5. (2) What space is available? The space indicated for the applications lab was approximately 23’ x 26’, which was partitioned into a general lab work area and a tissue culture room. Once the rooms were more or less sorted out now it was time to decide what we wanted for bench space. 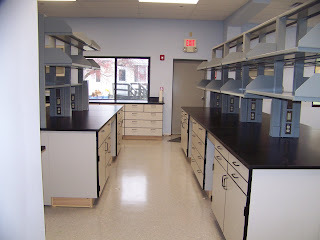 It’s a lab so we need lots of counters and storage. The current lab has an island in the center which I like a great deal so this type of setup would be incorporated into the new lab space. Island type counters, unlike peninsula allow access from all directions making movement around the lab easier. In addition to island bench space, a great deal of wall mounted cabinetry with counters would also be included. This should allow sufficient space for the plethora of equipment that already resides in the applications lab. Once the space considerations have been decided upon, its time to put pen to paper and layout the space. If you are like me, you better make it pencil, as there will be a few changes before you get things right. I prefer the hand drawn method of design, but the use of computer aided design will work just as well. In addition to the cabinetry items such as safety equipment (i.e eyewash and safety shower), sinks, faucets etc have to be decided upon, along with their location. Large equipment purchases such as freezers (-80°C, -20°C) refrigerators, autoclaves, tissue culture incubators, biosafety cabinets, floor model shaking incubators, etc. all had to be purchased and places designated in the new lab space. These items can be purchased new and/or used. 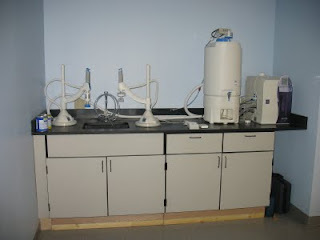 We used a combination of both to outfit the lab space. As the budget was not eligible for TARP funds, not everything could be purchased in the same physical year. Hopefully, we will get to buy some more presents for ourselves next year. Change, change, change…While all of the planning is taking place several things are happening outside one’s control that directly impact all of your well made plans. As I mentioned previously, others are involved in the overall design so wall positions and dimensions are still changing as a result of newly discovered code requirements, discrepancies in the original layout plans, the need for janitors closets, pre-existing plumbing design, builder’s whims, etc. With a 6 inch change here and a 6 inch change there, your carefully laid plans for equipment placement is soon a piece of fiction. The plan is soon obsolete and in need of being changed. Decisions, decisions, decisions…After the basics equipment has been chosen now it s time to decide water and electrical requirements. This is basically answering a number of questions: Where do I need power outlets? How high off the floor do they need to be? Are they 110V or 220V? Do they require a special outlet? The island cabinets require power that is dropped from the ceiling. The plumbing questions are a bit more basic. What size fitting do you need? Does it require a drain? Answering these questions of course requires that you know where everything is to be located, which as I explained previously can change. Fortunately I wasn’t asked about the color of the switch covers or outlets. Time, time, time…You have ordered the cabinetry along with the installation based on a predicted finish date supplied by the builders. You have mentally checked that piece of work off from your list of things to do only to find out that the completion date has been put off. This requires that you contact the cabinet manufacture to find out if you can push the delivery date back; only to find out that the cabinets have already been manufactured and that it will cost more to store them for a period of time. Meanwhile boxes of other purchased items are starting to pile up outside your office. Having learned your lesson, you pad the new delivery date by an extra week, only to find out even that date was optimistic and you need to contact the cabinet guys a second time. If you are fortunate vendors for other installed items are flexible in the installation date. As the days progress, boxes of parts and equipment begin to form a mountain around your office and your co-workers make polite inquiries as to when the mess of boxes will be removed. Move, move, move…The day has finally arrived. The space renovation has been completed and you can now move into the new space. Only now do you realize exactly how much new stuff has been ordered, along with how much instrumentation you plan on moving from the old laboratory space. Time to purge some stuff. With good fortune there will be a facilities manager that will arrange for assistance to move much of the material. Regardless, plan on spending considerable time and energy (mental as well as physical) with this task. With the placement of instrumentation in the new space you find that carefully thought out planning only goes so far. Much of the layout design will work, but expect to have made a number of misjudgments. It will take some time to work out the best layout. End, end, end…The bottom line is that with some hard work and a large pile of money you too could have new laboratory space. In my case, a number of different people provided valuable assistance, without their help the new lab would not have happened. As with any renovation, a positive attitude and sense of humor go a long way toward making the process tolerable. In the end, the result was worth it.